Acting EPA chief Andrew Wheeler said he mostly worked on protections for miners. In his first official remarks to employees since taking over after Scott Pruitt's resignation, Andrew Wheeler, the acting head of the Environmental Protection Agency, told career employees Wednesday he is "not at all ashamed" of his past work for a coal company. Providing employees with some background on himself, Wheeler acknowledged that his work as a lobbyist for the coal company, Murray Energy, was the part of his career he's most often associated with, but added he had dozens of other clients, and that in the last four or five years he mostly worked to "shore up" pension and healthcare benefits for retired coal miners. Wheeler said he is "not at all ashamed of the work that I did for the coal company" and that he was actually disappointed that before he left his private firm, he wasn't able to do more to guarantee the pension benefits. "My grandfather was a coal miner during the depression, my grandmother raised her children in the coal camps in West Virginia, in fact, I still have some of the company script that she used to buy food in the company store," he told employees gathered at EPA headquarters. "And so the work that I did on behalf of the company to try to help the retirees of United Mine Workers is the reason the United Mine Workers endorsed my confirmation when I was nominated last year. I don't think that story has been out there and I think as employees of the agency you need to know that about me." 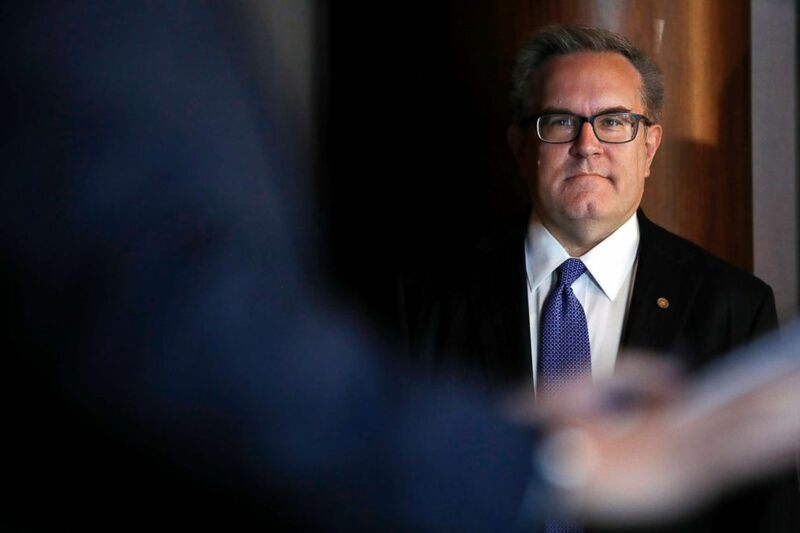 (Jacquelyn Martin/AP) Environmental Protection Agency (EPA) Acting Administrator Andrew Wheeler listens as he is introduced to speak to EPA staff, July 11, 2018, at EPA Headquarters in Washington D.C.
Wheeler became acting administrator of EPA last Friday after now-former Administrator Scott Pruitt resigned. Wheeler did not reference the reason for his predecessor's departure, which Pruitt said in his resignation letter was personal attacks against him and his family. There are multiple ongoing investigations into Pruitt's conduct and spending since taking over the agency. "I do understand firsthand the stress that goes along with a change in management or a change in reorganization," Wheeler told EPA employees. "And we're going through that change now, and I understand how stressful that can be and I'll let you know that I understand that and I'll try to minimize the stress that you all deal with as employees here at the agency"
While Wheeler's remarks didn't discuss policy in detail, he said that he plans to continue Pruitt and President Trump's agenda. As for his priorities, he said he wants the EPA to focus on how it works with people affected by large-scale events such as 9/11, the Gold King Mine spill, or the water crisis in Flint, Michigan, which he called the "poster child" for the need to improve communication. "The reality is that risk communication disproportionately impacts people at the lower end of the socioeconomic ladder. They are the ones who often live, work, or go to school near an industrial facility or an area with environmental hazards, and they are the most impacted by how well or how poorly we communicate the environmental risk to them. The EPA owes it to the American public to be able to explain in very simple, easy to understand terms what are the risks they face in their daily lives," he said. The acting president of EPA's largest employee union, however, said that Wheeler's comments were simply trying to "quell the dissent" and that he will continue policies that aren't in line with the agency's mission to protect public health. "A successful coal lobbyist doesn’t change his stripes. He will continue to champion deregulation and permit big polluters to evade compliance altogether. With Wheeler at the helm, we can expect EPA’s enforcement pendulum to shift from exaggerated overreach to something dangerous that they call "enforcement discretion." Plain and simple, this “regulatory certainty” is the new unregulated capitalism," Denise Morrison, the acting president of the largest union of EPA employees around the country, said in a statement. Environmental groups including the Sierra Club and some Democrats also expressed opposition to Wheeler. Rep. Don Beyer, D- Va., was a vocal critic and tweeted that "everyone who cares about environmental protection must remain vigilant." In his first speech as Acting EPA Administrator, @EPAAWheeler says "thanks to the leadership of... Administrator Pruitt we have made tremendous progress over the past year and a half."